Dogs Bite Decatur Al: HOUSTON TX - PITS DRUGS GUNS CRIME ...AS NARCOTICS OFFICERS SERVED A SEARCH WARRANT A PIT BULL CHARGED AT THEM AND WAS SHOT AND A MAN INSIDE THE HOUSE SHOT 5 OFFICERS!!! HOUSTON TX - PITS DRUGS GUNS CRIME ...AS NARCOTICS OFFICERS SERVED A SEARCH WARRANT A PIT BULL CHARGED AT THEM AND WAS SHOT AND A MAN INSIDE THE HOUSE SHOT 5 OFFICERS!!! 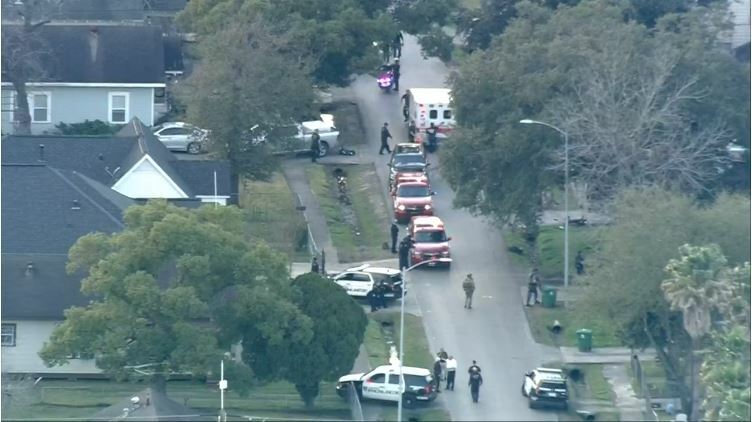 Four Houston police officers remained hospitalized Tuesday afternoon, a day after a shooting that injured five officers and and left two suspects dead. The shooting occurred around 5 p.m. Monday in the 7800 block of Harding Street in southeastern Houston. Police Chief Art Acevedo said that about a dozen narcotics officers were serving a search warrant, backed up by a half-dozen patrol officers. As police breached the front door, a PIT BULL lunged at them and an officer shot the dog. A man in the home then began shooting at police, and a number of officers returned fire. According to Acevedo, 59-year-old Dennis Tuttle and 58-year-old Rhogena Nicholas were killed after they attacked police. The dog also was killed. Acevedo said that Nicholas was shot trying to take a weapon away from a wounded officer who had fallen on the couch inside the home, which belonged to Tuttle. Four officers were struck, and a fifth suffered a serious knee injury, police said. Two of the officers were shot in the neck and remained in serious condition Tuesday. One of them, the 54-year-old leader of the team, had been shot multiple times in a 32-year-career, Acevedo said. The other, a 40-year-old, has been with the department nine years. "I can tell you he's in a fight. He's stable, but he needs prayers," Acevedo said of one of the officers.A 50-year-old officer who has been with the department 25 years was shot in the face and was in good condition Tuesday. That officer may be released later Tuesday, police said. The officer with the knee injury, a 50-year-old who is a 27-year veteran of the force, also was in good condition and expected to remain in the hospital. A fifth officer, 33 years old and a 10-year veteran of the department, was struck in the shoulder and released Monday night. The injured officers' names were not released, nor were the names of four other officers who fired their weapons. I wonder why criminals choose pit bulls? I don't think I'll ever be able to figure that one out. Is it because pit bulls are nanny dogs?